G. P. Johnson Hightower, the 2019 Walk to Cure Arthritis Corporate Chair, is Managing Member of Hightower Properties, LLC. Johnson has served on the Board of Directors of the Arthritis Foundation, Oklahoma Chapter for many years including two terms as Board Chair during 2005-2007. Johnson is a fifth generation Oklahoma Cityan and a graduate of Casady School. He earned his B.A. in Economics and Environmental Studies from Vanderbilt University and M.B.A. from the University of Oklahoma. He worked in the field of finance and commercial and real estate banking for almost 40 years until shifting to full time management of his family real estate company. He also has served on the Boards many local civic and charitable foundations and chaired most of them throughout that time. Diagnosed with arthritis in 2001, Johnson is an advocate of the Arthritis Foundation’s goals of funding research grants and advanced medical investigation to continue development of enhanced medications not only to treat and relieve pain caused by the many forms of arthritis, but ultimately to find cures for the disease. 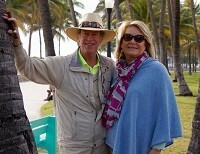 As Corporate Chair, his emphasis is to raise awareness and increase fundraising efforts of the Foundation. Johnson and his wife, Millie, have been married for 42 years and have three children who live in Bloomfield Hills, Oklahoma City and Denver, and five grandchildren. To support Johnson as this year's Corporate Chair, click here to join his team and/or donate. 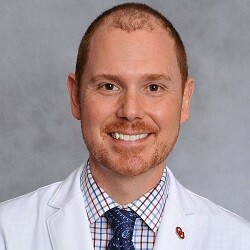 The 2019 Walk to Cure Arthritis Medical Honoree is Dr. Matlock Jeffries of OU Medicine. Dr. Jeffries received his MD degree in 2010 from the University of Oklahoma and subsequently completed his Residency in Internal Medicine in 2013 with a subsequent year as a peer-selected Chief Resident in 2014. He went on to finish Fellowship training in Rheumatology in 2016 and then joined faculty at the University of Oklahoma. He is dual board certified in Internal Medicine and Rheumatology, and his clinical work focuses on the early recognition and treatment of a variety of autoimmune diseases and osteoarthritis. He has received numerous clinical, teaching, and research awards, including being recognized as a Fellow of both the American College of Physicians and American College of Rheumatology. He has pursued basic science and translational research extensively since 2005; his research focuses on the contributions of epigenomic alterations to rheumatic disease, particularly regarding epigenetic patterns that may underlie the development and progression of osteoarthritis (OA), the most common age-related musculoskeletal disease worldwide. In 2014, he published one of the first genome-wide DNA methylation studies of OA cartilage, and subsequently published the first such study of OA subchondral bone. He also has several ongoing longitudinal clinical studies investigating the utility of biomarkers for osteoarthritis progression. He currently serves on the Local Leadership Board for the Arthritis Foundation and is honored to serve as this year’s Medical Honoree in hopes that his role will raise funds and awareness for the arthritis community that he serves. To join/donate to Dr. Matlock’s team “Sooner Sprinters,” click here. This year’s Warrior Engagement Chair is Mandie Plaster. Mandie is a mom of three children: Aiden age 9, Landon age 8, and Zoey age 5. Her oldest son Aiden was diagnosed with Juvenile Arthritis at the age of 5 and because of that Mandie is very passionate about helping the Arthritis Foundation and those who suffer from this disease. In addition to serving as this year’s Warrior Engagement Chair, Mandie has previously served as a guest speaker for a United Way presentation, attended multiple JA Family Days, and has attended multiple JA National Conferences. She hopes that her role as Warrior Engagement Chair will serve as a platform for recognizing our arthritis warriors and for providing an enhanced experience for those who attend this year’s Walk to Cure Arthritis in Oklahoma City. Her goal for her Walk team “Team Aiden” is to be one of the top fundraising teams at this year’s Walk – to support “Team Aiden,” join their team and/or donate by clicking here. 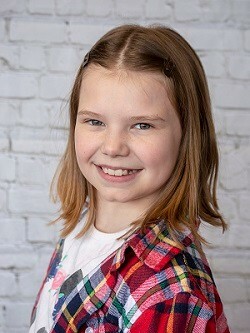 The 2019 OKC Walk to Cure Arthritis Youth Honoree is 10-year-old Aralyn Pace. 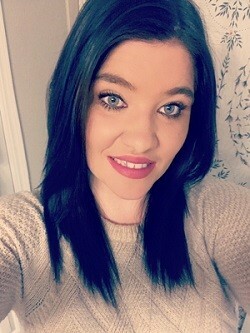 Aralyn has experienced arthritis symptoms since the age of seven and while she’s been to many different doctors who believe she definitely has something in the autoimmune, arthritis, connective tissue disorder family, she still does not have a definite named diagnosis/subtype. She has almost daily pain in her knees, ankles, wrists, fingers, neck, back and hips and is also hyper mobile and already showing possible scoliosis. Aralyn loves tumbling and dancing and rarely let’s this disease slow her down! Being active in dance sometimes is a struggle and occasionally filled with bouts of pain, but she smiles through it all with this invisible disease. Aralyn has a big brother and sister along with three dogs, two cats, and two ferrets. She loves animals and is often called the animal whisperer by her parents. She’d like to be a dance teacher and/or veterinarian when she grows up. Aralyn was able to attend the National Juvenile Arthritis Conference in Seattle this past year where she made many friends all over the country, and it showed her she is not alone. This experience has renewed her fight against this disease, and her family is fighting right alongside her bringing advocacy and awareness of the Arthritis Foundation to their community’s attention. She is so thrilled and honored to be the Oklahoma City Walk to Cure Arthritis Youth Honoree and hopes you can support her team by clicking here.